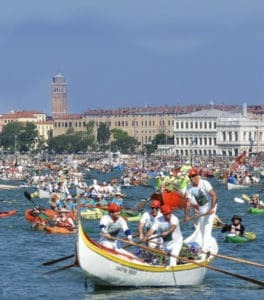 As you may know, many regattas take place in Venice during the year, and the Vogalonga is one of them. You’ve probably heard or read something about the most ancient and famous one of them all, the Historical Regatta, but we assure you that the Vogalonga also has a nice backstory. To know more about its origins, we need to travel back in time to 1974, when a group of passionate Venetian rowers organized a small, friendly regatta on “mascareta” boats (a traditional light Venetian boat). Venetian people appreciated that initiative so much, that it became a regular appointment for all the enthusiasts of Venetian rowing. Actually, the main reason why this event became so popular is tied to the desire of Venetians to maintain ancient Venetian traditions alive and fight against the decline of the city, due to the waves caused by the motorboats. Venetians aren’t the only ones who attend the race. Since the very first time the Vogalonga took place, many people from Chiogga, Caorle, Padua, Treviso, and other cities came to Venice to be part of this incredible event. Numerous boats reached St. Mark’s basin on May 8, 1975, ready to start the race and give a strong message to the government. Venetians were ready to fight for their city, with unusual weapons – their oars. What does “Vogalonga” mean and why is it the name of the race? “Vogalonga” is a term that comes from Venetian dialect, and it’s composed of two words – “Voga” and “longa”, where the former means “rowing” and the latter means “long”. We can translate the word with “long rowing race”, as participants have to row for 30km, between canals and islands. We said it’s a non-competitive race, but we didn’t say it isn’t hard! The Vogalonga rowing race is more recent than the Historical Regatta, but the main purpose here is having fun celebrating the ancient Venetian rowing style, living the city among locals. The race starts in St. Mark’s Basin, just like the very first time Vogalonga took place in Venice. Then, the itinerary touches some of the lesser-known Venetian islands such as Vignole, San Francesco del Deserto, and Sant’Erasmo. Burano and Murano islands are the next ones to be reached, then the race finishes crossing the Grand Canal, with all its beautiful mansions on both sides. This year the Vogalona will take place on June 9, you find all info on the official website of the race, where you also find out how to sign up. We just have a question for you: can you row like a Venetian? Go then, and experience one of the Venice events locals are most passionate about!